We are delighted to announce that GWP Architecture have been appointed by the University of Worcester to develop and deliver the refurbishment of the grade II listed Austin House. The £2m scheme will transform the building into the Art House – a collaborative work/teach/gallery space for students studying at the institution. The 2-storey building was originally constructed in 1938 as a car showroom with large open plan, top lit areas across a split-level. 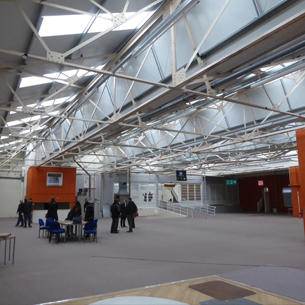 The control and focus of this existing natural light will be key to the scheme’s success as part it’s repurposing into a creative, contemporary, flexible space. This selection follows another successful appointment at the end of last year by the Aurora Wellbeing Centres in Worksop. To refurbish and extend the grade II listed <a href=”http://gwp-arch.com/news/gwp-chosen-to-transform-listed-worksop-library-and-museum/”>Worksop Central Library and Museum</a>. We look forward to working with the University of Worcester on this interesting project.